What steps do you take to ensure our drinking water is high-quality and safe? We work with the First Nation communities in the Shoal Lake area, the federal government and the provincial governments of Manitoba and Ontario to make sure that Shoal Lake, our source of water, is protected. We routinely test our water each step of the way, from Shoal Lake to the tap. We use nationally accredited laboratories for the tests and we do more sampling than required by our Operating Licence, including more bacteria and chemical testing. We treat the water at our new state-of-the-art drinking water treatment plant. We disinfect the water with chlorine to kill harmful viruses and bacteria, such as E. coli. We use ultraviolet light to protect against waterborne parasites, such as Cryptosporidium (crip-toe-spor-ID-ee-um) and Giardia (GEE-ar-dee-ah). We add orthophosphate to the water to reduce the amount of lead getting into tap water from lead pipes. We also add fluoride to the water to help prevent tooth decay. Is drinking water quality regulated? The Act requires that we submit an annual report of our water supply system to the Office of Drinking Water and post a copy. Under the Act, the Province's Office of Drinking Water issues an operating licence for our water system. Our Operating Licence requires that we regularly monitor the quality of our drinking water. The routine tests are reported on a monthly basis to Manitoba Sustainable Development. The guidelines, published by Health Canada, recommend limits for substances and conditions affecting drinking water quality. Some of the guidelines are set as aesthetic objectives and a maximum acceptable concentration for health has not been set. A panel of experts, including a representative from our province, keeps these guidelines up-to-date. Does our drinking water meet the Canadian drinking water quality guidelines? Winnipeg's water continues to comply with the requirements of the Operating Licence issued by the Provincial Office of Drinking Water, with Manitoba regulations, and with Guidelines for Canadian Drinking Water Quality. What tests do you do to ensure water quality? Our testing program includes over 46 different types of tests at over 70 different places throughout the year. Staff use approved test methods and have backgrounds in science, such as chemistry and engineering. We monitor chlorine levels at the Water Treatment Plant and the three pumping stations in the city, 24 hours a day, 365 days a year. We test the chlorine levels throughout the distribution system and at other places, such as water mains, every week to ensure ongoing disinfection. We collect weekly samples for bacteria (also an indicator of the presence of other micro-organisms, such as protozoa and viruses), at 60 locations throughout the distribution system and test them according to provincial regulations. Each year, we test more than 3,000 water samples for bacteria, this is more than what is required under our operating licence. 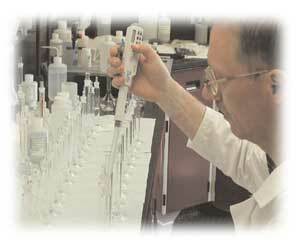 A nationally accredited laboratory conducts the bacteria tests. We test the turbidity levels (clarity) of the water. We test chemical and physical parameters, including aesthetic objectives that affect taste and colour (e.g., iron and manganese). We continually update the provincial Office of Drinking Water and the regional Medical Officer of Health on our findings. We collect samples at least monthly for the microscopic parasites, Cryptosporidium and Giardia, which are found in most rivers and lakes, even though there is no requirement for this type of testing. A nationally accredited laboratory tests our water samples for Cryptosporidium and Giardia. We monitor to make sure that the lead control program is effective. Occasionally, test results for some locations do not meet a drinking water quality standard. In these cases, we take immediate corrective action(s) (e.g., retesting the water) to ensure our water remains safe. We immediately report results that might affect public health to the Winnipeg Regional Health Authority's Medical Officer of Health and the Provincial Office of Drinking Water. Because water quality is so important, we do more testing than the provincial government requires. Is additional water quality information available for the drinking water system? Yes. We have water supply system compliance information for our monthly, quarterly and annual monitoring and reporting of the quality of our drinking water as well as our Water Supply System Annual compliance report. We also have water quality testing information available for Shoal Lake, Deacon Reservoir and distributed water and customer reports archives.